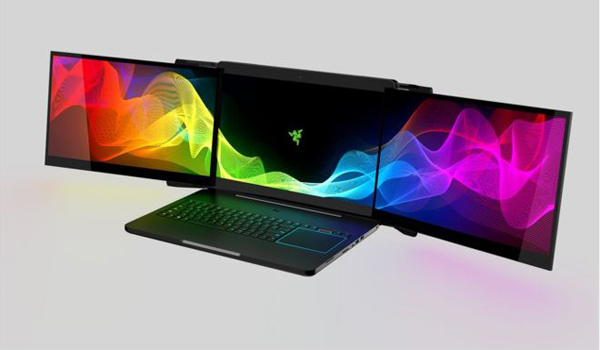 The concept devices from gaming company Razer boasts three 4K screens and is said to be the first portable laptop of its kind. Razer said the devices were taken from its press room on Sunday. Chief Executive Min-Liang Tan said that his company was treating the case as "industrial espionage". A Razer spokesperson said it was offering $25,000 for any "original information leading to the identification, arrest and conviction" of those allegedly involved in the crime. "Our teams worked months on end to conceptualise and develop these units," he said in a post on his official Facebook page. "It is cheating, and cheating doesn't sit well with us. Anyone who would do this clearly isn't very smart." Headquartered in California, Razer was founded by Singaporean entrepreneur Min-Liang Tan. The brand enjoys a cult status among the gaming community, who favour its sleek product designs and innovative offerings. Gamers from around the world expressed their excitement about the device which is part of the firms Project Valerie. "Razer always finds a way to outclass other brands. No offense to people who like other products," said Jason Vicencio. "This device is a dream come true for every gamer on the go, no more having to cram graphics and line of vision into just one screen," commented Artie Derilo. But other Facebook users like Malachy Hamilton questioned its design. "What's the point in three screens? The point of a laptop is portability and being able to do work and some light gaming on the go," he said. "For this, you'd need a beefy battery which would increase the weight, therefore making it less of a laptop."